It's the last day of our month about Water. My best tip for saving water (it's easy to remember too): drink water. I come up short in the green department in many, many areas. But in the beverage department I'm doing pretty well. That's because I drink mostly tap water from a drinking glass or my reusable water bottle. My son (standing next to me and reading over my shoulder) wants you to know that he drinks water from a reusable water bottle/ sippy cup too. I drink milk on occasion, juice on occasion, and every now and then a root beer. I avoid any beverage packaged in plastic (my milk comes in reusable glass bottles). It takes 37 gallons of water to make a cup of coffee. It takes 63.4 gallons of water to make a cup of wine. It takes 54.9 gallons of water to make a cup of milk. It takes 1.85 gallons of water to make a single-use plastic water bottle. I'm guessing it requires more than a cup of water to bring a cup of potable water to your kitchen sink, but presumably less than the above. I got most of the above statistics from National Geographic's Hidden Water We Use. 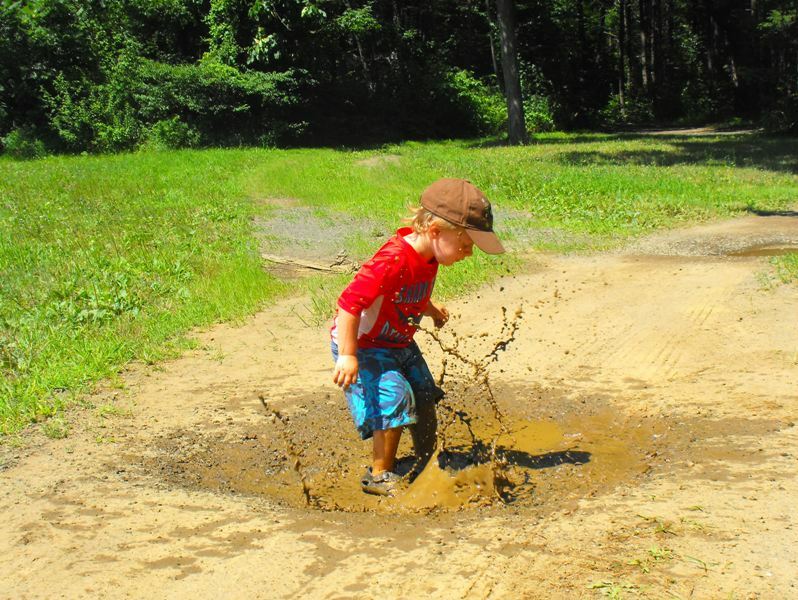 Check out their Water Footprint Calculator, Water Use Game for kids, and Freshwater 101 Quiz. Another cool site: Water Footprint Network. In conclusion, to save water, drink water. 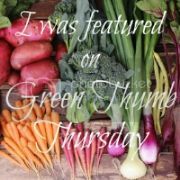 EWG's "Good Food on a Tight Budget"
This is a great resource--they've taken it so many steps beyond the Dirty Dozen here, it's proactive rather than reactive, gives a huge selection of choices to make as opposed to just choices to avoid. The whole guide is right there online, or it exists in printable form: shopping lists, budgets, recipes, a list of tips for healthy shopping and eating, information about what proportions of each kind of food to buy and use, where the pesticides lurk and where they don't--it's really good. This is one to keep, I think! As a person who blogs, it's natural that I like all things social media. I've succumbed to facebook (although I've been ruthlessly unfriending these past few months) and am constantly trying to strike a balance between sitting in front of a screen and keeping the blog up and going. The most surprising find, though, for all things virtual connection, has been Twitter. Yes, I may have scoffed at the shear ridiculousness of posting random messages as if anyone else would care what I had to say. A place of constant facebook updates? How is that useful or meaningful? Except... well, what do you know- Twitter actually CAN be useful! Here's what I have learned so far, in case you either a) can't believe there is anything meaningful in Twitter at all and are prepared to scoff at my discoveries or b) are participating in the twitterverse but still aren't seeing useful results. First off, you don't need a smart phone for Twitter. I don't have a smart phone, and I don't check Twitter compulsively all day. A couple of times a day is fine. Yes, it's another social media to check, but it is MUCH less time consuming than facebook or blogs. Since, ya know, you just have to scroll through some updates. Once you get past the basics of how to use twitter (posting, retweeting, hashtags) using a program like Hootsuite or TweetDeck will be incredibly useful. They organize information in different streams that will help you easily get information so you can immediately see when someone tags you in a post, communicates directly with you, or what people are posting under your chosen hashtag. Find someone who you think you'd like to follow, check out who they are following and follow them. Following businesses and organizations is cool, but follow 'regular' people as well. You'll get more interesting information that way. I follow people from Nova Scotia, who are environmentally friendly, and who practice yoga. In order to really be successful and get people to follow you, you'll need a real picture (otherwise that little 'eggy' picture will just make you look like a robot), a normal description of 'who' you are (with or without identifying information), and you'll actually need to engage other people on twitter. Otherwise you really are just narcissistically posting stuff no one cares to read. Engaging means actually looking through other people's tweets, retweeting what you think is cool or worthy, or responding to tweets. - Gather information about a topic. If you have a question about something, you can send it out in the twitterverse with the right hashtag and get an answer within minutes. It's fantastic. For example, if you're travelling in a new city and want to know where the best independent organic coffee spots are- you can just send out a tweet with that city's hashtag (i.e. #Halifax). Voila, you'll get some suggestions! - Find out information almost immediately. For example, I found out one morning that power outages were happening all over the city, progressively getting closer to our apartment. It was just in time to make coffee and breakfast before we lost power as well. Traffic updates are also pretty darn handy, as well as just regular nosy city happenings. When stuff happens in Halifax, twitter has information about it WAY before the online news media. - Share and connect with people on a much more mundane basis. If you have something to say but it's really not worthy of a facebook update, or blog post, you can tweet it. For example, a friend of mine will be travelling to New Zealand in a month by herself. Once she's there, if she sees something super cool and just wants to share it quickly- Twitter is perfect for that. - Spread the word about an event. People use twitter. 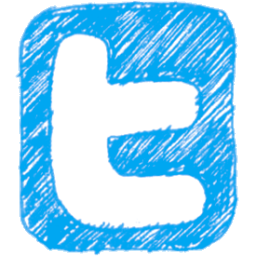 If you have an event happening, or a business, sharing the info on twitter will help spread the word. Even if you think twitter is dumb, if all your customers or potential participants are using it, then it's worth looking into. Using hashtags you can organize events or encourage change and a certain (albeit virtual) form of activism. Like Five Seed's Starbucks flashmob encouraging Starbucks to actively offer their coffee in for here mugs. Of course there are many other ways you can use Twitter, and it definitely doesn't replace the personal connect that facebook or blogging has (although I have felt 'more' connected to some of my twitter peeps because I'm reading little daily stuff that they are tweeting), but if used interactively, Twitter has it's place. 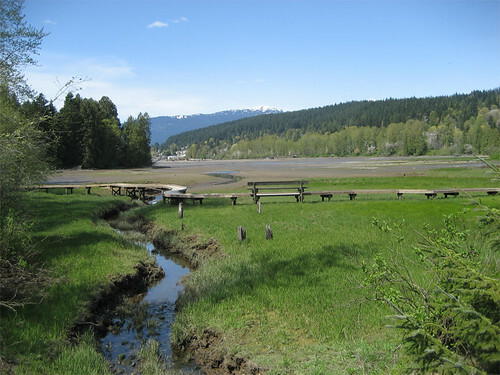 The Climate Crusader extols the beauty and diversity of a salt marsh on Canada's Pacific coast. After reading Eco Yogini's post about the relative merits of the Atlantic and Pacific oceans, I felt the need to respond from Canada's other coast. I grew up here on the Pacific ocean, and having visited Canada's Maritimes I will concede that there is a difference. 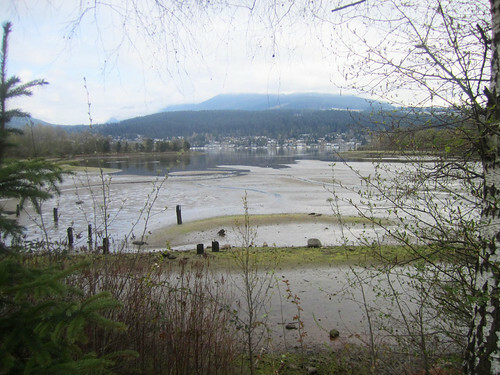 It's important to remember that while Vancouver is a city on the sea, it's a city on a protected bit of ocean, since Vancouver Island lies to its west. The water is calmer, certainly. But there are some amazing habitats here, with diverse and ecologically important species. Salt marshes play a large role in the aquatic food web and the delivery of nutrients to coastal waters. They also support terrestrial animals and provide coastal protection. Like many other ecosystems, salt marshes are under threat. Human development and invasive species are causing strain. As they disappear, the effects of their loss ripple through the oceans. The young fish that seek shelter in their grasses are lost. The migratory birds that visit have lost a habitat. Fortunately, there is a growing recognition of the importance of salt marshes, and efforts are being made in many places to protect and restore them. If you visit one, it's important that you stay on marked walkways or well-worn paths, so that you don't disturb sensitive areas. Don't pick plants or flowers, and don't litter. Back at home, don't pour chemicals down stormdrains, and don't wash your car in a place where the soap can run into the street and into the storm sewer. All of those chemicals will end up in local waterways, which can make their way into coastal areas like salt marshes. I feel very lucky to live close to such a beautiful area. Is it better than the Atlantic? I think I would just say that it's different - and I can appreciate the beauty of both coasts. Back in the day, I loved to read. I read on the couch. I read in the car. And in the summer, I read... out on the driveway... in the rain! We had kid-sized folding lawn chairs, and I'd take one of those, umbrella in hand, book tucked under my arm, and park myself. It was inconvenient to hold both book and umbrella, so I devised a way to tie the umbrella to the chair back. That problem solved, I relaxed into the stories on the pages, and the concrete-warmed water running over and under my bare feet (blissfully unaware of the complications caused by warm stormwater runoff). Some fifteen or twenty years later, Mr. Truffula and I bought our own house. [It also has a driveway, though I haven't read any books out there in the rain. 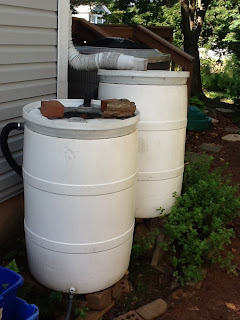 :-) ] To help me collect water for the then-fledgling garden, I got four rain barrels. We sited the barrels, and did the best we could to set up their water flow. Mr. Truffula wielded the hacksaw to cut off the downspouts. We then attached an extender to feed water into the barrels... checked the forecast. Now, I could hardly wait until the next drops fell! The rain came soon enough, and out I went. Holding the umbrella while needing both hands to adjust hoses and barrels was no easier than it had been to juggle my book. I alternately cast the umbrella aside and did a sort of umbrella handle tuck between my ear and shoulder, like you would do with a phone. I quickly learned that rain barrel tweaks coincide with downpours, since that is when your hook-up failures become (painfully) obvious. What I didn't know then was how I'd also learn to (re)love rain in the forecast. It's not "bad" weather (except when I'm in the midst of my public transportation commute! ); it supplies my plants with precious drinks of water. Each rainfall helps to recharge my 200-gallon supply. Lugging the water around in 5-gallon buckets underscores its value. The buckets are heavy. I aim carefully for the root zones. Any spills, mis-pours, or runoff mean more trips back and forth. They also mean that some of the stored supply is wasted. That's not a big issue when it rains frequently enough. 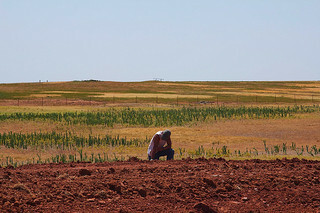 In stretches of drought, it has gotten dicey. I'm loath to use drinking water out in the yard. To avoid emptying the barrels completely, I start rationing water long before public water restrictions kick in. When the barrel bottoms come into sight, shower water gets pressed into service. I'm also more in tune with the seasons. Before the winter freeze sets in, the barrels need to be emptied. Ideally, I accomplish that task before the water gets really, really cold. I'm grateful for that when it splashes onto my hands and pants. And, when the likelihood of a barrel freeze passes, it's time to connect everything back up to start collecting for the next growing season. What unexpected lessons have you learned from your garden watering? Green Eye for the New Computer? Leaving all the rest of the passionate repartee out of it, there’s one aspect of that whole noisy incident I’d like to look at: the question of what we buy, where it came from, whom we buy it from, and who produces and creates it? I can’t tell you how many times during the whole debate about CFA, political stances, boycotts, and so forth I heard someone say, “Oh for heaven’s sake, you can’t worry about every single company you buy something from, what they stand for, where the product comes from, and all that stuff, or you’ll go crazy!” And usually, right at that moment is where I’d enter the debate. Because crazy or not, as far as I’m concerned, that’s where responsible consumerism enters the picture. Because once you start paying attention to that very batch of questions, once you open your eyes to the impact your purchases have on people and environments all over the globe, it’s hard to close them again. And yes, it makes you crazy, because so often there aren’t any “good” choices, all you can do is try your best. Community-supported agriculture and secondhand clothing is easy. Replacing your need-it-for-work-and-life-circumstances computer when the old one dies—that’s pretty hard. In about 2006 I bought a refurbished Toshiba notebook computer. It was honestly the best machine I ever used, it was fast and non-buggy and rarely gave me any trouble. And in the spirit of the greenie, I have held onto it ever since then. I upgraded the hard drive, I upgraded the memory, I replaced the battery and then the AC adapter; every time it started getting frustrating and slow I figured out something I could do to make it work better without actually discarding it and purchasing a new machine. Then last week it…just kind of died. My husband the computer geek helped me confirm that the hard drive and all my data were fine, and to fully and finally back everything up so I wouldn’t lose anything important, and then he took it to work to see if his fellow computer geeks could figure out why it wouldn’t power up. Over that long-seeming weekend I had time to decide what I would do if they couldn’t fix it. And with the “you can’t worry about all that stuff, you’ll go crazy!” refrain of many pro-CFA facebook friends ringing in my brain, I went into research mode. I looked up a lot of websites, and a lot of information, much of it very likely out of date. In terms of labor practices, there’s almost no possibility of a good choice: they all seem to be made in China at the same few giant companies that overwork and underpay their employees and have them living in fairly squalid conditions. All the major companies seem to have pledged to get PVC and brominated flame retardants out of their products, but many set dates by when they would have it done that are far in the past, and they still haven’t pulled it off. Apple seems to be the only one who’s actually gotten a lot of the toxics out, and they seem to be more responsible about recycling than many of the others. On the other hand, Apple seems far more into the whole “planned obsolescence” thing than most of the PC companies—with an Apple, everything’s glued together and in one piece, so there’s almost no possibility of just kind of replacing a part here, a chip there, a drive over here. It’s all or nothing. Another Wikipedia article on criticisms of Microsoft business practices. The EPEAT website, a registry for greener electronics. They have a registry page where you can search for computers in the bronze, silver, or gold categories, or where you can look by manufacturer. A discussion of the criteria they use can be found here. Most of the US is currently under a drought, including my state, Oklahoma. Oklahoma is mostly under an extreme drought with a tiny bit under a severe drought left and a growing area under an exceptional drought, which is the highest level. Oklahoma is currently under a state of emergency as well a statewide burn ban, due to the drought. My town, and many across Oklahoma, has issued watering restrictions to try and curb water use. However, these restrictions are hard to enforce and many are violating them, putting strain on our water supply. Last summer we had a drought as well and the hottest summer ever in the U.S., that summer we had to be put under a water emergency at one point, yet people still didn't follow the rules. We are used to going to the tap and having clean water, many are unable to grasp that, that may not always be the case. States and cities are already fighting over water. In my state two local tribes, the Chickasaws and the Choctaws, are currently in a legal battle with the state of Oklahoma over water rights. These fights are becoming more common as clean water is becoming scarcer and our demand keeps rising. The EPA says, "with water use in the United States increasing every year, many regions are starting to feel the pressure. In the last five years, nearly every region of the country has experienced water shortages. At least 36 states are anticipating local, regional, or statewide water shortages by 2013, even under non-drought conditions." Read that, "even under non-drought conditions." Most of the country is under drought conditions right now and there is concern that this could be our new norm. And a water crisis would also be a food crisis, as we are already seeing this summer. The Mississippi River is a major part of how we get food and other supplies around the U.S. and lately there have been some major issues with using the Mississippi for transport. We have witnessed in resent history just how important the Mississippi River is and what part of it being shut down can do to our food supply and other commodities. After Hurricane Katrina, barge traffic on the Mississippi River was shut down and no tankers or other cargo ships were able to go in or out of the Port of New Orleans. This lead to a rise in price of many products as supplies were limited. While major changes need to be made to our water system, we can all make a difference. In 2000, the U.S. used more than 148 trillion gallons of water, that includes residential, commercial, agriculture, manufacturing, etc.. and adds up to almost 500,000 gallons per person. That's a HUGE water footprint. But we can each reduce that number by changing our habits. Buying less stuff helps reduce the water used in manufacturing, using smart irrigation for your yard, or better yet none, not wasting water in your home, when buying new toilets get ones that use less water, the list goes on and on. While the worry about shortages in oil is a scary one as so much of our lives depends on fossil fuels, a water shortage would be even more devastating. We can live without oil, we can't live without water. I would love to hear your tips for saving water, as well as any personal stories you have about how the current water issues are impacting your life, be sure to share in the comments below. Growing up on the ocean has it's effects on you. I do believe particularly, that growing up on the Atlantic Ocean has a different result than the Pacific. Having been to the west coast, and touched the Pacific, I was surprised how I missed the raw, clean power and Strength that is such an integral part of the Atlantic Ocean. The 'Ocean'ness of the Pacific seemed to be missing. 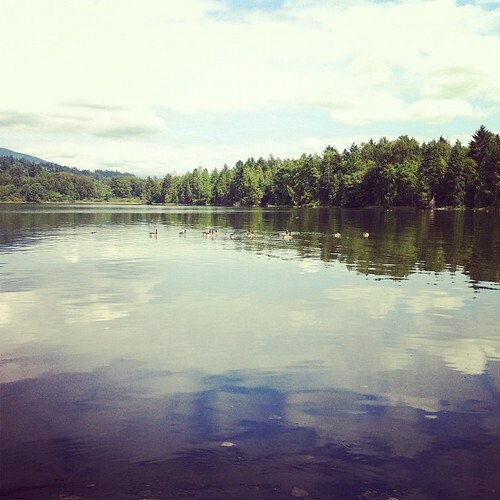 It's possible that it's where I was (Vancouver vs some other part of the west coast). But I don't think I could live without the Atlantic Ocean. In fact I know lakes just don't cut it- I tried living away for 10 years near rivers and lakes with similar results. My ocean has fog, rocky beaches and powerful salty cold waves. I also strongly believe that even living in a coastal city, it's not the same as growing up connected to the ocean shore. Although you can never forget where the ocean is from Halifax (the noisy seagulls reminded us just today while we were in our parking lot), just the fact of being surrounded by so much 'city' is a kind of separation from Nature. Even the green spaces, Point Pleasant and the Public Gardens are filled with sounds of city traffic and container ships. Once I knew what chemicals were doing to my precious and essential ocean, to my family's livelihood (daughter of a lobster fisherman) how could I continue to pollute? 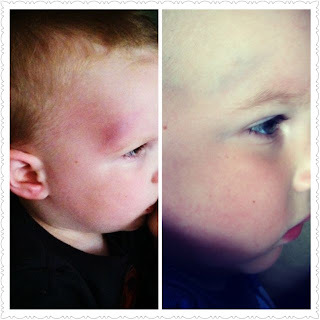 With a clumsy preschooler and a recently walking toddler, there are lots of boo-boos in our home. And then, their mother who does silly things like slip getting into a pool and bruise her foot all the way to the bone. Like I said, lots of boo-boos. So right now, in my natural medicine cabinet, Arnica is getting a lot of attention. Either in a cream or a homeopathic pellet, it's been amazingly helpful. 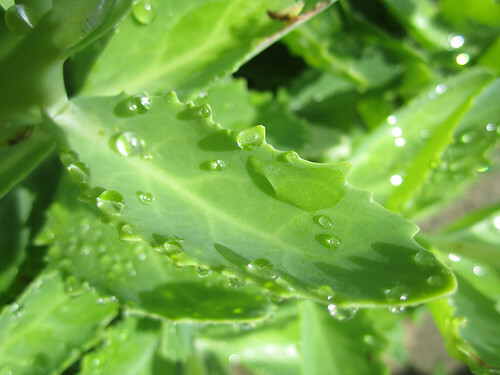 Arnica treats bruising, sprains, muscle aches, swelling from bug bites and joint pain. I had originally bought it to help my muscles recover as I participate in the Go Green Get Fit Challenge and it's been great to come in from a workout, take 2 pellets and feel the muscular discomfort slip away. When I slipped in the pool, I really thought I had broken my bone, it hurt so badly. My doctor told me that it would take up to 2 or 3 weeks to heal to the point that I would be able to resume my normal activities. I've been taking Arnica faithfully since last Tuesday... I ran a mile and a half Saturday morning with no pain. The most awesome recovery so far was Liam's when he flipped off my bed. I gave Liam Arnica every 15 minutes after he fell until he went to bed that night. It was red and purple and swollen when he asked to sleep that night, but there was no sign of any internal damage, so I let him go. The next morning, I anxiously greeted him, assuming there would still be a nasty bruise, even if the swelling had gone down. If I hadn't taken a photo the night before, I would have thought I imagined the whole incident as I could barely see a line on Liam's forehead. I had the opportunity to interview Peter Gold from the Natural Center for Homeopathy a few months ago and learned so much about the functions of homeopathy. I prefer to use a natural solution for illness where ever possible and with the increasing availability of homeopathics in my area, I'm excited to keep learning about options for healing that don't rely on a lab to create the appropriate chemical concoction. What are your favorite natural remedies for the inevitable bumps and bruises that come along with life? The Climate Crusader lives in the rainy Pacific Northwest - but water is still on her mind. This month at the Green Phone Booth we're taking aim at water. I live in Vancouver, a city that gets more than its fair share of rainfall. When your plants are all drowning in your garden in early spring, it's really easy to take water for granted. Because water is so abundant here, I used to groan inside when I had to write about it. What difference does it make to my friends half a continent away who are experiencing drought if I turn the water off while I'm brushing my teeth? Much of the food we eat travels a thousand miles or more from the farm to our table. A lot of that food is grown in places that don't get a lot of rainfall. For example, over 90% of all leafy vegetables grown in the US from November to March come from Yuma County, Arizona. 70% of the water we remove from rivers, lakes and aquifers at a global level goes to irrigate food crops. Animal products also require a lot of water, because we must first grow the feed crops for the animals, and then provide them with drinking water as well. 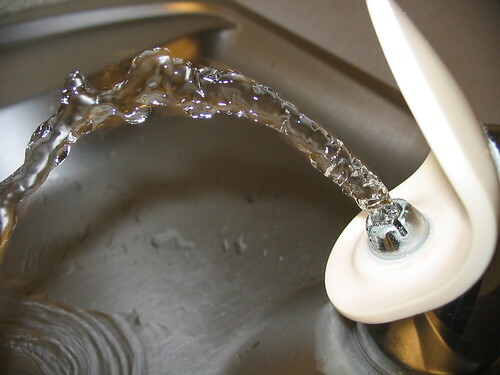 30% of the food we grow goes to waste, which literally means water down the drain. What this means is that even if you live in a place that sees a lot of rainfall, as I do, your actions can have a direct impact on the water supply someplace else. You don't even have to live in the same state or same country - here in Canada most of our winter veggies come from Arizona, as well. Eat less meat, eggs and dairy and more plants. Grow your own food, and preserve local food in season. Reduce your food waste by planning your meals before you go grocery shopping, and eating leftovers. The world's population is growing, and the fresh water supply isn't. It's important that we all work together to ensure that we're not wasting this precious resource. This is true whether you live in the desert, or in the middle of a temperate rainforest as I do. Do you have any other tips for reducing how much water you waste? Please share them! 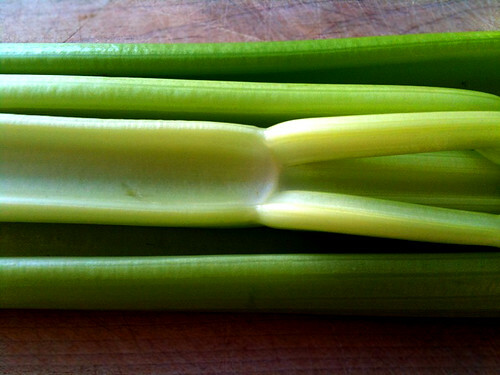 Cold celery. My baby is still toothless. We'll have to play it by ear once she gets teeth. I got this one from my sister who got it from her mother-in-law. A real favorite. Cold carrot stick. I give her a 3 or 4 inch piece, either a smaller-size carrot, or a big one cut in half or fourths lengthwise. Bone. Use with discretion. I have a South American husband who will lick a bone clean, and then I feel it's safe to give to the baby. I'm guessing that a bone was the original teether. Also gives your baby a taste for meat, if, in fact, this is a plus for you. If you cannot get absolutely every piece of gristle off the bone, don't try this one. Other hard foods to try: a very hard piece of bread. I've read that the Italians give babies the rind of a wedge of Parmesan cheese, which is, indeed, very hard. My finger. In a pinch, a finger works well. I try to make sure my hand is pretty clean before letting her stick it in her mouth. Sophie the Giraffe. This is the toy most like a plastic toy because it's soft rubber. It also has a squeaker. My kids have liked this one, but probably not enough to justify the steep price tag. Wood ring. I have purchased a number of wood rings off Etsy unfinished or finished with natural finishes like beeswax, including this one and these ones which you can wear as a necklace, which is handy in a public place where you don't want your kid sucking on a toy that fell on the floor. They are inexpensive and lovely and could be used for many things when the baby stage is over. Wood keys. Love these wooden keys I purchased from Etsy shop Mama Made Them. My older kids are always trying to steal the baby's wooden keys for their own pretend play. Wet washcloth. It's nice if she's sucking on one I purposely got damp with filtered water instead of the dirty one I used to clean her siblings' faces. Cotton stuffed animals. I found some cute 100% organic stuffed animals from Sckoon that are not too expensive. My babies have enjoyed sucking on the ears and hands. Metal or wood spoon. Use with caution, as the baby can gag herself. This did happen with my baby a couple of times, but now at 8 months, she hasn't done it in months. And she's learning dexterity with a spoon! What are your favorite baby teethers? 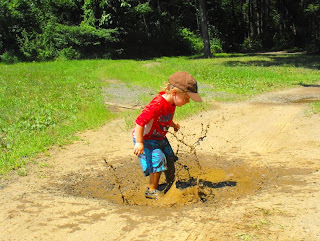 Puddle Jumping - Wordless Wednesday with Linky!